BNP Paribas / Strutt & Parker have been appointed to work with us to market the Shire Hall site, as we seek to move closer to our communities and reduce costs on accommodation overall with a smaller administrative 'hub' in Alconbury. As part of this work, on Friday 7 September 2018, the agents carried out a full inspection of the site and areas that may be part of the disposal, including the bunker, car parking under Castle Court as well as the Police House, Register Office, Shire Hall, The Octagon and the Shire Hall / Octagon roof. They took photographs including aerial photos by drone and general site photos which may form part of the marketing particulars. 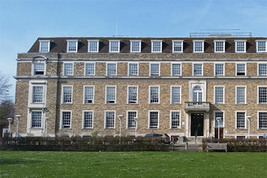 The company has considerable experience in marketing similar historically important properties for lease or sale, including the Manor House in Sidcup for the London Borough of Bexley, an 18th century building in a conservation area, Dorton House in Kent, a Grade II listed Georgian building in 49 acres used since the 1950s for administrative, education and accommodation purposes for the Royal London Society for the Blind, and the five acre National Institute of Agricultural Botany site in Cambridge. In mid-August, we held our latest in a series of Cambs 2020 staff focus groups. Attendees were asked to carry out a score analysis of the Hub and Spokes model, identifying the Strengths, Challenges and Opportunities we should consider, the Resources we will need, and how we can Evaluate and measure success. More information is available on Camweb in Cambs 2020 section. Further follow up meetings in September with the main political groups on the council will follow a drop in session for all Members after the last Full Council meeting. Our new major fostering campaign launched on Wednesday 12 September 2018. Part of our work to manage the increase of children needing our care is to vastly increase the number of in-house foster carers available. Challenge 100 - can we all save £100 before March? We face tremendous pressures with a growing number of children in our care, currently around 700 at any one time. There has been a 17% growth in the number of people aged 65+ in the county in the last four years, and with increasing age there are greater complexities in the care needed. Cambridgeshire is the fastest growing county in the UK. Our extra population means more demand on our infrastructure, yet we are the third worst funded shire county. Please remind yourself about Fairdeal4Cambs campaign. Having a budget gap doesn’t mean we’ve done anything wrong – a lot of the work we’ve been doing on innovation and transformation of services will be, is and has been superb. As part of this we want to give all staff the chance to contribute by making small changes in their working lives – and have launched a challenge for everyone to save just £100 before March which would save £0.5m. Challenge 100 asks staff to think about what small changes they can make to save at least £100, be it using reducing mileage by using Skype, handing in IT and phone equipment they don’t use, or using CCC venues for away days and training. You may have seen our posters around the building. Senior Management have started making their pledges, and we would love to see you on our Pledge Wall (available to view on the Challenge 100 page on Camweb). Please contact communications@cambridgeshire.gov.uk for more information or to submit your pledge. The Staffing and Appeals Committee has this week endorsed the proposal of a joint director of Legal and Governance Services to be appointed to cover both Cambridgeshire County Council and Peterborough City Council. The proposal will also be considered by Peterborough’s Employment Committee in mid-September. This joint post will continue the successful arrangement between the two councils to share senior roles across the senior and corporate leadership teams where this delivers benefit for both authorities. In particular for Cambridgeshire, it will increase the council’s in-house legal support expertise at director level, with the Director being responsible for commissioning legal services for CCC from LGSS Law Ltd.
As part of our efforts to secure CCC email transport (particularly for our shared service partners including Peterborough City Council) we moved to a new secure email gateway from Trend Micro at the start of April 2018. Managed by LGSS, this replaced a service provided by Virgin Media Business, our outgoing network provider, and thus allows us more control over mail spam filtering and malware protection. This has helped us resolve a long-standing issue: a high proportion of legitimate bulk mail was being misidentified as spam, and thus blocked, including some from our partners and even CCC's own bulk mailing systems. LGSS configured the system to liberalise the anti-spam rules, whilst keeping protection against malware and known spammers fully robust. Unfortunately this allows a small amount of spam to filter through (spam being defined as unsolicited emails that don’t have a working unsubscribe link). Members may have noticed this increase in spam in their own inboxes. Given permission from affected staff or Members, LGSS IT can look at the Trend logs for their email to see what spam has been blocked or allowed through, and if staff and Members forward any such spam to the Service Desk we can look into whether there's any improvements that can be made to the filters. Affected staff and Members can also routinely unsubscribe to unwanted emails with that option to reduce the volume. If you have any questions, please contact Matt Whiting, Head of IT - Matt.Whiting@cambridgeshire.gov.uk. Change4Life and Disney, with the support of Sport England, joined forces to launch a brand new ‘Train Like A Jedi’ programme over the summer months. It takes children on a galactic adventure and inspires them to get more active. Children need at least 60 minutes of activity per day, and just 23% of boys and 20% of girls currently meet this recommendation. The Public Health Team will give all Cambridgeshire Stop Smoking Service providers (GP practices, pharmacies and CAMQUIT) resources provided by Public Health England which will include a PowerPoint and audio presentation briefing which includes details on how the Stoptober campaign should best be implemented, posters and leaflets. The Public Health Directorate has been working with the Communications Team, NHS and community partners on a social marketing campaign to encourage older people (particularly women 70-79 years old) to take up strength and balance exercises twice a week, to reduce their risk of falling and keep them doing the things they enjoy. The ‘Stay Stronger for Longer’ campaign is due to launch on 1 October 2018 – International Older People’s Day. A competitive tender for a new Healthy Schools Support Service has been completed with the contract being awarded to Everyone Health, the current Integrated Lifestyle Service provider in Cambridgeshire. Libraries around the county are looking forward to a new season of arts activity. The Library Presents autumn season starts on Saturday 15 September 2018 and will continue bringing high quality arts activities into the heart of towns and villages until Saturday 15 December. Ely Southern Bypass is anticipated to deliver a huge boost for the area, easing congestion in and around Ely by providing a new link between Stuntney Causeway and Angel Drove avoiding the notorious level crossing and low bridge. In the last few months, having overcome problems in delivering such a challenging design on a floodplain and near a national heritage site as quickly as possible, the project has continued to progress well. Work is due to commence on a new lift at Ely Library from Saturday 8 September until Wednesday 17 October 2018. This work is essential to improve fire safety provision and provide accessibility for all. The library will be closed on certain days. If you have any feedback on this newsletter you would like to share with us, please get in touch by emailing communications@cambridgeshire.gov.uk. This service is provided to you at no charge by Cambridgeshire County Council.